ATLANTA, GEORGIA, May X, 2015 – In a first for Australia and the world, NanoLumens, the world’s leading manufacturer and marketer of LED visualization solutions, today announced the installation of the world’s first native 4K 2.5MM LED display, part of a larger NanoLumens solution, at the newly redesigned Telstra Customer Insight Center (CIC) in Sydney, Australia. Spanning 3600 square metres over the entire second level of Telstra’s 400 George Street office in Sydney’s Central Business District, it houses a 300-person auditorium, workshop and collaboration spaces, partner pop-up installations, a restaurant, and many hands-on technology demonstration areas featuring state-of-the-art business solutions. Andy Bateman, Director of Segment Marketing at Telstra, explained that the centre was designed to bring together leading-edge technologies, innovations and insights to shift customers’ expectations of what’s possible in their business – and how Telstra can help. NanoLumens worked with its regional sales representative, Digital Place Solutions and Portland, Oregon-based design firm Downstream to achieve the goal of realizing a digitally intimate experience through the creation of three unique digital connection zones. 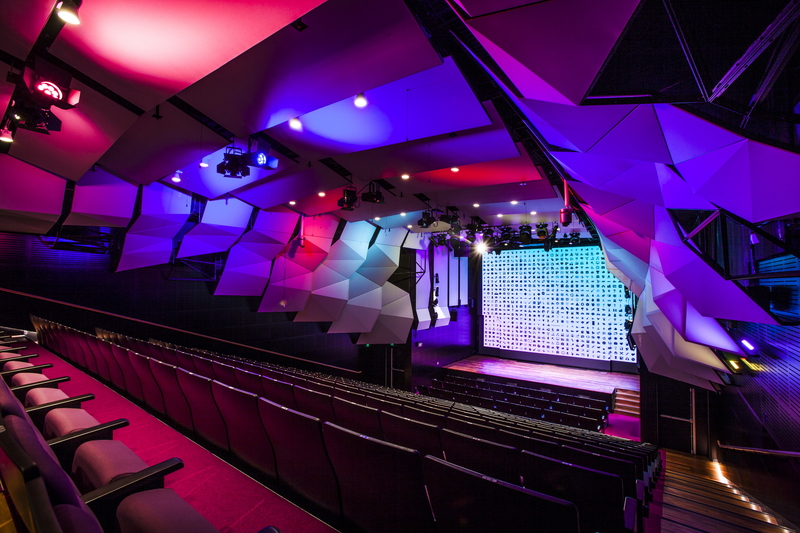 The zones consist of a 300-seat auditorium whose focal point is the NanoLumens NanoSlim Engage 2.5MM native 4K LED display. 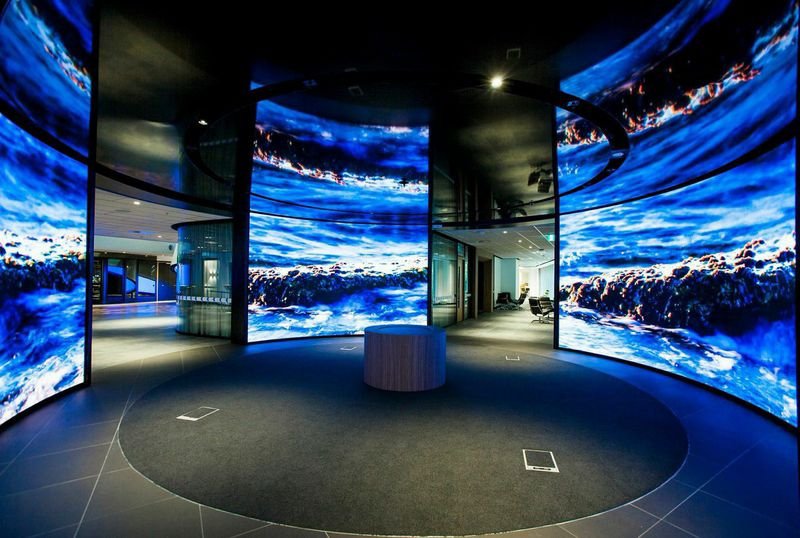 The 7.5-metre X 7.5-metre display — nearly 25 feet square — is the very essence of digital intimacy, bringing incredibly high resolution images into the theatre. 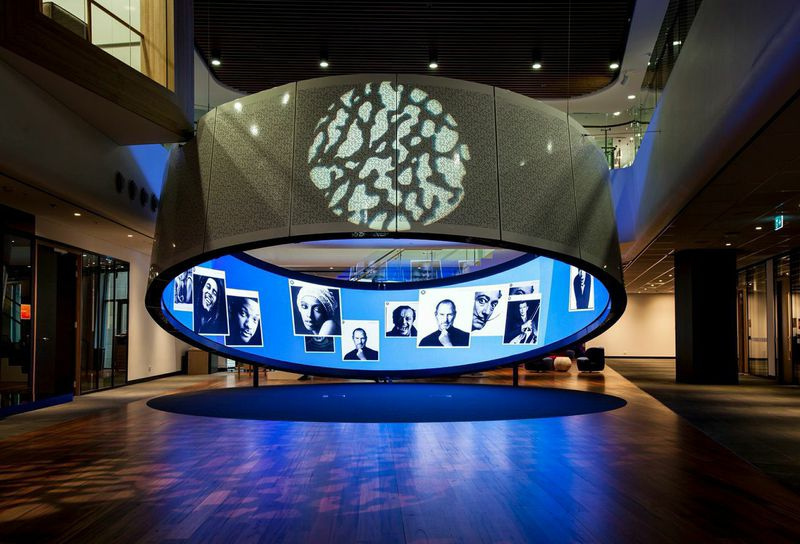 That theme is extended to the centre’s Partnership Hub — a Stonehenge-like assembly of three 4.5-mm pixel-pitch NanoCurve displays (3.02m x 4.3m, 3.02m x 8.3m and 3.02m x 3.46m) that go from floor to a reflective ceiling and create an immersive space where product and services solutions take on both intimacy and immediacy. The centre’s Insight Ring, which uses a 1.87m x 7.34m NanoCurve display in 4.5MM pixel pitch, accomplishes this immersive effect within a unique curved space that is enveloped by a circular enclosure that’s suspended at 17 degrees in the centre’s newly creation visitor reception area to convey at once a sense of intimacy and openness. There, visitors will be welcomed with bits of their own information, such as their names and titles, via RFID-enabled badges given to them by Telstra. Information about products and services useful to them will be shown on the same display. NanoSlim Engage is designed to allow customers to engage their audiences up close and personal. The new high resolution, large-scale visualization solution from the industry leader in indoor LED displays comes backed by an unprecedented corner-to-corner six-year warranty and is designed to serve as the ideal display solution for board rooms, command and control centers, and other areas where clear and up-close viewing is required. It is also the first LED display solution able to be both front installed and front serviced. 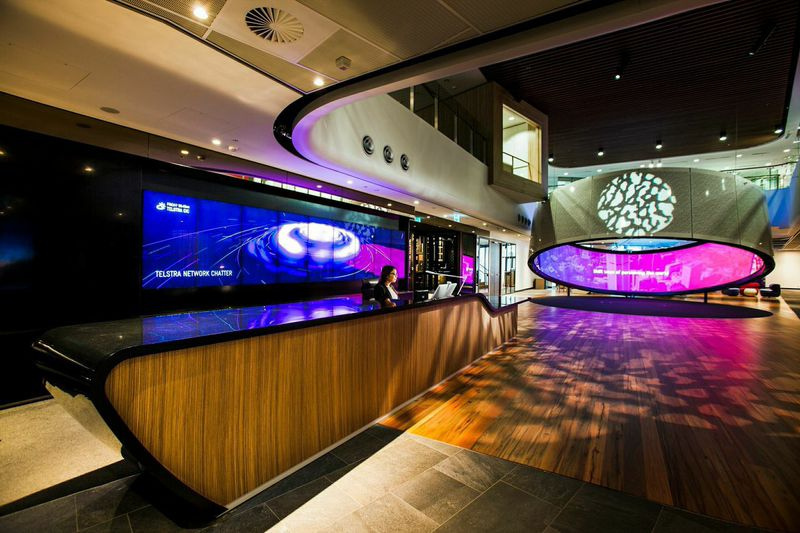 The installation at Telstra marks the first time that this solution has been installed in a customer environment.